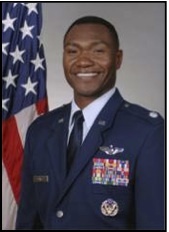 Lt. Col. Rodney Lewis is one of four military members in the 15-member 2011-2012 class of White House Fellows. Lewis, who previously commanded the 4th Airlift Squadron at Joint Base Lewis-McChord, Wash., is a C-17A pilot who was directly responsible for the Defense Department’s only Prime Nuclear Airlift Force, which handles sensitive cargo and provides tactical C-17A crews that airdrop combat troops and supplies anywhere in the world. Prior to his command position, he was assigned to the office of Legislative Liaison, Secretary of the Air Force, Washington, D.C., where he served as the executive to the senior general officer, according to his White House Fellows biography. In 2004, Lewis received the bronze star for his service in Iraq, and in 2010, he was awarded the Air Force Association National Medal of Merit for his work with medically challenged children in the Pilot-for-a-Day program. Lewis holds a B.S. in human factors engineering from the U.S. Air Force Academy and an M.S. in systems management with honors from the University of Southern California. He will spend the next year working in the Office of the First Lady. The White House Fellows program, founded in 1964, is one of America’s most prestigious programs for leadership and public service. White House Fellowships provide first-hand experience working at the highest levels of the federal government. Fellows also participate in an education program consisting of roundtable discussions with renowned leaders from the private and public sectors, and trips to study U.S. policy in action both domestically and internationally. Fellowships are awarded on a strictly nonpartisan basis, according to the White House. Question is why aren’t we getting our taxdollar out of this lump?….he should be flying not hanging out with MO. If this the best position we can find for for a Lt. Col. , then consideration that this position and candidate be added to the list of Airmen being culled from the force is appropriate. Amen! How is working with the first lady going to do him any good? Will he learn how to take expensive vacations and plant gardens? WTF? Nope, check his record. This guy is a shoe in for full bird, maybe even a beltway generalship a la Colin Powell. Hopefully there is some benefit to the Air Force, I wish the article would explain that better.